Revel™ brings updated author-written content into your course each semester. Click the Features tab to find out what’s new! Revel International Relations enables students to form a framework for analyzing the complex and constantly changing information that comprises our increasingly interconnected world. Opening students’ eyes to the positive and negative events that occur across the globe every day, authors Jon Pevehouse and Joshua Goldstein offer a strong foundation in current global affairs, with insight into topics like foreign assistance in the developing world, the changing nature of war, and global poverty levels. The 11th Edition explores themes of international relationships from economic, social, and political standpoints. 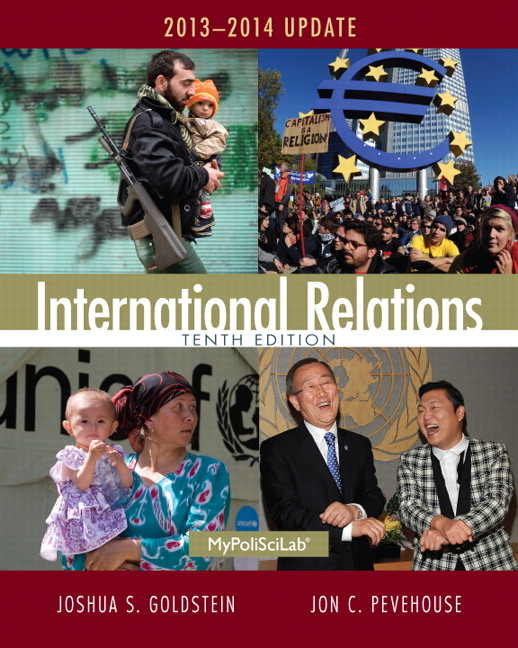 Through human-scale stories that touch on broader themes such as war and peace, humans and their environment, poverty and development, and more, Revel International Relations provides students with relatable material to understand international relations. Revel is Pearson’s newest way of delivering our respected content. 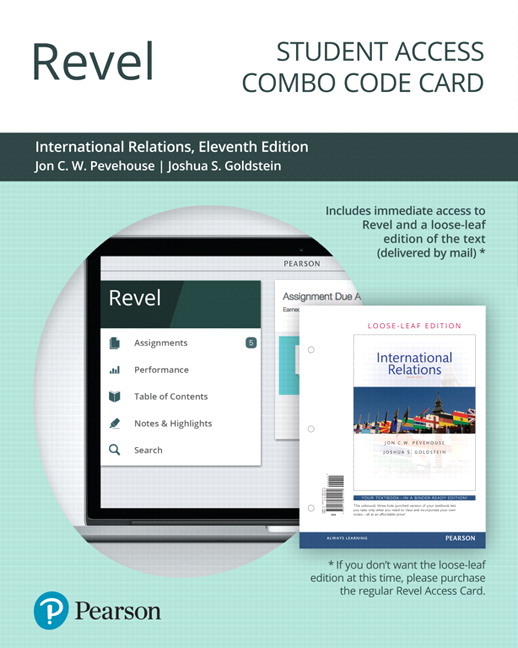 Fully digital and highly engaging, Revel replaces the textbook and gives students everything they need for the course. Informed by extensive research on how people read, think, and learn, Revel is an interactive learning environment that enables students to read, practice, and study in one continuous experience — for less than the cost of a traditional textbook. Updated - Why is There a Growing Backlash against Globalization? Updated - What is the Status of U.S. Negotiations with North Korea? New - Are women making electoral gains around the world? New - How Will Divided Government Shape Foreign Policy in the United States? New - Can the War in Yemen Be Won? Updated - Are African States Withdrawing from the ICC? Updated - Will Virtual Currencies Become Important for Global Finance? Updated - Can the Paris Climate Agreement Succeed? Updated - Why is World Hunger on the Rise Again? Updated - What is the Outlook for Global Economic Growth? Integrated within the narrative, interactives and videos empower students to engage with concepts and take an active role in learning. 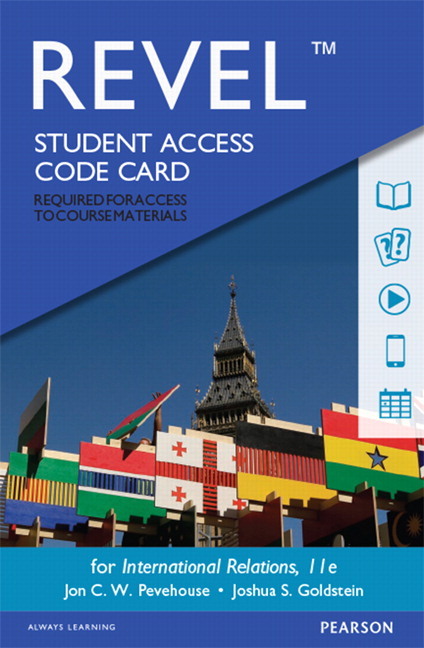 Revel's unique presentation of media as an intrinsic part of course content brings the hallmark features of Pearson's bestselling titles to life. Revel's media interactives have been designed to be completed quickly, and its videos are brief, so students stay focused and on task. Located throughout Revel, quizzing affords students opportunities to check their understanding at regular intervals before moving on. Revel’s integrated writing tools enable educators to introduce writing — among the best ways to foster and assess critical thinking — into the course without significantly impacting their grading burden. Self-paced Journaling Prompts throughout the narrative encourage students to express their thoughts without breaking stride in their reading. Assignable Shared Writing Activities direct students to share written responses with classmates, fostering peer discussion. Revel’s fully mobile learning experience enables students to read and interact with course material on the devices they use, anywhere and anytime. Responsive design allows students to access Revel on their tablet devices and smart phones, with content displayed clearly in both portrait and landscape view. Highlighting, note taking, and a glossary let students read and study however they like. Educators can add notes for students, too, including reminders or study tips. Revel’s assignment calendar allows educators to indicate precisely which readings must be completed on which dates. This clear, detailed schedule helps students stay on task by eliminating any ambiguity as to which material will be covered during each class. And when students know what is expected of them, they're better motivated to keep up. Revel’s performance dashboard lets educators monitor class assignment completion as well as individual student achievement. It offers actionable information that helps educators intersect with their students in meaningful ways, such as points earned on quizzes and tests and time on task. Of particular note, the trending column reveals whether students' grades are improving or declining — which helps educators identify students who might need help to stay on track. UPDATED! Chapter 1’s data on economics and demographics has been completely updated throughout, as has the material on Middle East conflicts in Syria, Libya, Yemen, and the Iranian nuclear negotiations. Information on East Asian maritime tensions has also been updated. NEW! Chapter 1 has a new discussion of the Ebola health crisis in West Africa. NEW and UPDATED! Chapter 2 includes updatedinformation on NATO’s withdrawal from Afghanistan, as well as a new discussion of Russia’s annexation of Crimea. REVISED! The Seeking the Collective Good box in chapter 2has been revised. REVISED! Chapter 3 includes reviseddiscussion of “Women in IR” as well as updates on the Arab Spring transitions and violence in the Middle East. NEW! Chapter 4 includes new coverage of the congressional debate over the Iran nuclear deal. The Seeking the Collective Good box has also been updated. REVISED and UPDATED! Chapter 5 offers a revised list of wars of the world, as well as updated discussions of Islamic groups (including the rise of ISIS), civil wars in Yemen and Syria, and maritime tensions in East Asia. NEW! Chapter 5 features newdiscussions of violence in Nigeria, as well as Ukrainian-Russian tensions and violence. UPDATED! Chapter 6’s data on military forces worldwide has been brought up to date throughout. The discussion of drones and cyber warfare has been expanded. The discussion of Iran nuclear negotiations and the new nuclear agreement, and the Policy in Perspective box feature have been revised. UPDATED! Chapter 7’s data and discussion of current UN Peacekeeping efforts has been updated throughout, as has the discussion of the International Criminal Court. NEW! Chapter 7 includesnew discussions of the new UN Disabilities Treaty and Saudi Arabia’s refusal to join the UN security council. UPDATED! Chapter 8’s updated content includesdata and discussion of the economic crisis of 2008-9 and our continuing slow recovery, discussion of the struggle to complete the Doha round of negotiations over new WTO mandates, and discussion of global public support for free trade. NEW! Chapter 8 offers a new discussion of the controversial Trans-Atlantic and Trans-Pacific trade agreements. NEW! and UPDATED! Chapter 9’s new and updated content includesdata on global economic trends in international finance, as well as discussions of state economic positions in the global economy including Russian economic struggles, Chinese currency devaluations, and virtual currencies such as bitcoin. UPDATED! Chapter 10 includes an updated discussion of Greece’s economic difficulties. REVISED! Chapter 10 offers revised discussions of Eurozone countries and the global digital divide including updated data. NEW! Chapter 10 includes a discussion of attempts to create a new internet treaty. UPDATED! Chapter 11’s updates include discussion of negotiations for a comprehensive global warming treaty, attempts by China and the US to make smaller side agreements on environmental issues, as well as an updated Policy in Perspective box feature. NEW! Chapter 11 offers a newdiscussion of Ebola in west Africa. REVISED! Chapter 11 includes reviseddiscussions on the global fight against HIV/AIDS, as well as a revised Seeking the Collective Good box feature. UPDATED! Chapter 12 includes updated data on progress towards UN Millennium Development goals, as well as an updated discussion of world trends in economic development. NEW! Chapter 12 includes a new discussion of European immigration crisis. UPDATED! Chapter 13 includes a broader focus on developments in BRIC countries (Brazil, Russia, India, China), an updated discussion of foreign assistance based on new data from 2014-15, discussion of Chinese economic system including devaluations and stock market slides, and discussion of international debt with new data. Policy in Perspective boxes ask students to take the perspective of a national leader facing a real-world crisis and develop a policy response, helping students bridge theory and policy and the connection between domestic and foreign policymaking. Seeking the Collective Good boxes offer examples of collective good that states want to prove and how the three core principles of dominance, reciprocity, and identity are used to prove it. Let’s Debate the Issue boxes help students think through controversial topics based on important chapter concepts to reinforce major themes. A Careers in International Relations feature at the beginning of the book helps students envision future job opportunities in the field. These features explore fields such as nongovernmental organizations, government and diplomacy, international business, and teaching and research, help students understand how this class can help them find a job, and offer further reading on outside books and websites. Figures and tables help present and qualify quantitative data so students can scrutinize the implications of different theories and policies for themselves. Maps throughout the text and in a mini-atlas help students learn basic geography and link politics to places. Chapter 1 has a new discussion of the Ebola health crisis in West Africa. UPDATED! Chapter 2 includes updatedinformation on NATO’s withdrawal from Afghanistan, as well as a new discussion of Russia’s annexation of Crimea. Chapter 4 includes new coverage of the congressional debate over the Iran nuclear deal. The Seeking the Collective Good box has also been updated. Chapter 5 features newdiscussions of violence in Nigeria, as well as Ukrainian-Russian tensions and violence. Chapter 7 includesnew discussions of the new UN Disabilities Treaty and Saudi Arabia’s refusal to join the UN security council. Chapter 8 offers a new discussion of the controversial Trans-Atlantic and Trans-Pacific trade agreements. UPDATED! Chapter 9’s new and updated content includesdata on global economic trends in international finance, as well as discussions of state economic positions in the global economy including Russian economic struggles, Chinese currency devaluations, and virtual currencies such as bitcoin. Chapter 10 includes a discussion of attempts to create a new internet treaty. Chapter 11 offers a newdiscussion of Ebola in west Africa. Chapter 12 includes a new discussion of European immigration crisis. Jon C.W. Pevehouse is Professor of Political Science at the University of Wisconsin-Madison. He is an award-winning teacher and scholar. His research interests focus on international political economy, foreign policy, and international organizations. He is currently the editor of the leading professional journal in the field, International Organization. He received his BA from the University of Kansas and his PhD from Ohio State University. Joshua S. Goldstein is Professor Emeritus of International Relations, American University (Washington, DC) and Research Scholar, University of Massachusetts-Amherst. He is an award-winning scholar who has written and spoken widely on war and society, including war's effects on gender, economics, and psychological trauma). His book War and Gender won the International Studies Association's "Book of the Decade" award.